This charmingly naïve and remarkably well-preserved Elizabethan portrait was painted around 1592 to celebrate Sir John Puckering’s appointment as Lord Keeper of the Great Seal to Queen Elizabeth I. The Lord Keeper discharged all duties connected with the great seal, and was usually a peer, with a fixed status which him entitled him to the same ‘pre-eminence, jurisdiction, execution of laws, and all other customs, commodities, and advantages’ as the Lord Chancellor. He was charged with physical custody of the royal seal itself, which was housed in the seal burse (purse) that Puckering is shown here so proudly holding, spectacularly rendered and embroidered with the Royal Arms of England. The portrait can confidently be attributed to the Unknown Follower of Custodis, an artist first identified in 1969 by Sir Roy Strong on the basis of the recurring use of an identical form of inscription, as well as obvious stylistic characteristics. The artist seems likely to have been an assistant of Custodis and perhaps even inherited his master’s pattern book. Though his work lacks the subtlety of Custodis himself, it has its own delicacy, as evidenced here by the extremely fine and detailed portrayal of the sitter’s privy seal. The small attributable corpus of the Unknown Follower was assembled by Strong and published in his seminal work The English Icon in 1969. This group of some eleven portraits include a pair of pendant portraits depicting Nicholas Wadham and his wife Dorothy Petre, the founders of Wadham Colege, Oxford. Although more limited in their colour palette, they bear comparison to our portrait as they share a strikingly two-dimensional format. Sir John Puckering(c. 1543 – 1596) was a man of modest beginnings, but raised himself to the highest civil office in the state. Admitted to Lincoln's Inn on 10 April 1559, he was called to the bar in 1567 and became an administrator and speaker of the House of Commons before being knighted and sworn in as a member of the privy council on 28 May 1592. When he was appointed Lord Keeper of the Great Seal he succeeded Sir Christopher Hatton who had died in November 1591. Perhaps unfairly Puckering was reported to be ‘in manners and appearance such a contrast to his gay and gallant predecessor [Sir Christopher Hatton] - he was so dull, heavy, and awkward - his whole deportment was so lawyer-like and ungenteel’. Nonetheless, Puckering went on to entertain Elizabeth lavishly when she visited him at Kew in Surrey in 1595. 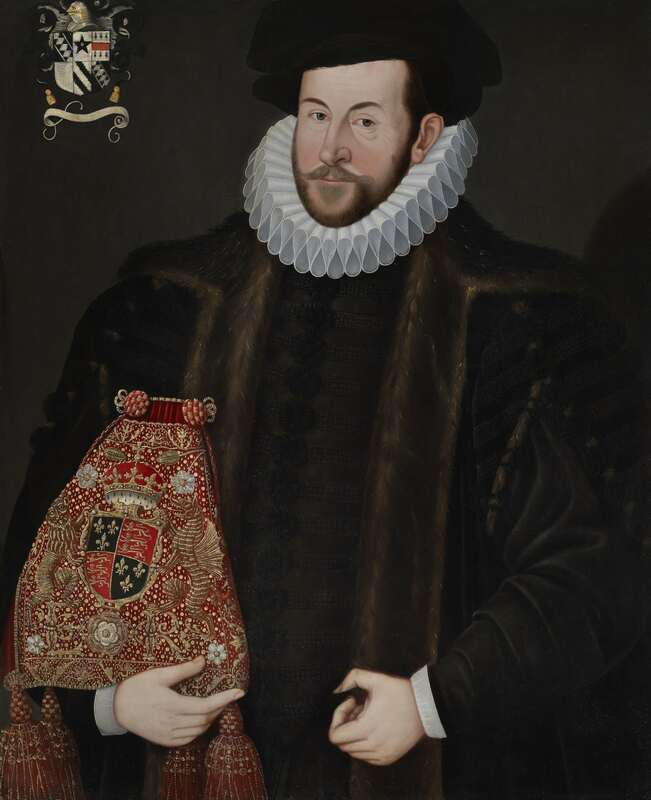 With such expenditure, and while petitioning the queen for a grant of land in 1595, Puckering complained that as speaker he had lost £2000 from his practice, and that the lord keepership cost him £1000 a year. But like previous lord keeper to the queen, Sir Nicholas Bacon (1510 – 1579) and his successor Thomas Egerton, 1st Viscount Brackley (1540 – 1617), Puckering bought land on a large scale, acquiring the manor of Weston, Hertfordshire, in 1593, and further Warwickshire lands in 1596. He died intestate of apoplexy on 30 April 1596, aged fifty-two, and according to his memorial inscription, leaving ‘no regret of him.’ He was buried in Westminster Abbey where his widow erected a substantial monument. R. Strong, ‘Elizabethan Painting: an approach through inscriptions – Hieronimo Custodis’, The Burlington Magazine, CV, 1963, p. 104.Hieronimo Custodis himself was a protestant émigré from Antwerp who had fled to England after the capture of the city by the Duke of Parma in 1585; his dated works are from 1589 until his death in 1593 and include the ravishingly beautiful portrait of Elizabeth Brydges (Woburn Abbey). R. Strong, The English Icon, 1969, pp. 207-214. Ibid., nos. 166 & 168 and 167 & 169 respectively. He was the eldest son of William Puckering of Flamborough, Yorkshire, and his wife, Anne, daughter of John Ashton of Great Lever Hall, near Bolton, Lancashire. On 21 February 1569 he married Jane (d. c. 1599), and had one son, Thomas and four daughters. John Campbell, The Lives of the Lord Chancellors and Keepers of the Great Seal of England, Vol. II, p. 182. British Library, Lansdowne MS 982, fol. 194. J. Cole, engraving (after tomb effigy), repro. in J. Dart, Westmonasterium, or, The history and antiquities of the abbey church of St Peters, Westminster, vol. 1 , p. 176.